What Do You Need To Know About the Chinese Fertility Calendar? When it comes to discussing the Chinese fertility calendar, there are a few crucial aspects that need to be taken into consideration. If you have been looking to get pregnant, then you would have heard about the Chinese fertility chart. In this article, I'll explain what it is and more importantly why you shouldn't rely on it. Also known as the birth calendar, the Chinese Fertility Calendar is basically a chart that predicts the gender of a baby, depending upon the mother’s age and the month of conception. According to the popular legend, it was found carved into the wall of a royal tomb, in a cave in China and is presently situated at the institute of Science in Beijing. This birth chart can be seen on a number of websites, and its accuracy is anywhere from 50 percent to 99 percent. I'll explain exactly why that discrepency occurs below. Let’s now ponder over how it works and what aspects it entails. This calendar has ages on one axis while months on the other axis. The ages have to be from 18 to 45. In order to use it, the user needs to find the box that corresponds to the maternal age and the month the baby was conceived. Each box identifies either male or female gender. It lets you know about the gender of the baby by allowing you to match up your age when you conceived and the month you conceived. First, it is important that you use the mother’s lunar age. This can be determined by calculating the number of lunar years in which the person has lived; that’s why, it is usually a year more than an individual’s age by western reckoning. Also, the lunar age multiplies at every lunar New Year, which normally occurs between Jan 21 and Feb 20. In addition to that, it is important for you to understand the fact that Chinese months don't usually correspond with Western months. There exist certain differences that must be taken into account. Each Chinese month starts on a new moon. Moreover, the ongoing Chinese calendar is amended to correlate with the solar year. For instance, there occurs a 13th leap month after every two or three years. If the Chinese fertility calendar is ancient, then it is likely to be based on an old lunar system, thereby rendering the dates slightly off. Also, all Chinese fertility calendars available on the Internet employ Western months, so it is not easy to tell if someone is using it accurately. However....I have a solution for this. What is your Chinese Lunar Age? Look up the date of the Chinese new year in the year that you were born and of the current year. Subtract 1 from your birth year if you were born before that year's Chinese New Year's Day, as determined in above. For example, if the Chinese New Year was on Jan. 31, 1976, and you were born on Jan. 16, 1976, then use 1975 as the basis for determining your age. Subtract 1 from the current year if the Chinese New Year hasn't occurred yet for the current Gregorian year. Now, find the difference between the results of Step 2 and Step 3, and then add 1. You add 1 because the Chinese count the time in the womb toward your age. That's your Chinese Lunar Age and the number you use in the chart below. With all this being said, there are generally two ways you can use the birth chart. First, if you are already pregnant, then you may try to predict the gender of the baby. However, you need to bear in mind the fact that it’s simply a guess; you will not be able to know until it is confirmed via an ultrasound. 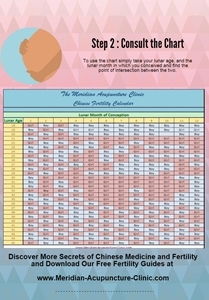 Moreover, you can also use the Chinese fertility calendar to plan the gender of your baby. When you are trying to use the Chinese fertility calendar, you would certainly want to be absolutely sure that you have done everything that you can do to get pregnant. Thus, if you keep these aspects in view, then you will be able to use the Chinese fertility calendar accurately. And to make sure you don't miss out on all my other fertility boosting gifts like my fertility tea recipes, subscribe to my newsletter so you are notified each week when a new article is posted. You'll also get access to a number of bonus files, recipes, fertility acupressure guides and more. Subscribe here today.